Smoothie King's Gladiator is a high-protein, low-carb smoothie designed to help you bulk up. The drink, intended as a meal replacement, combines the company's protein formula with two fruits of your choosing. It is sold in three sizes: 20 oz., 32 oz. and 40 oz. The 20-ounce Gladiator has 180 calories, and no calories come from fat. If you consume 2,000 calories a day, the Gladiator is equal to 9 percent of your total daily calories. 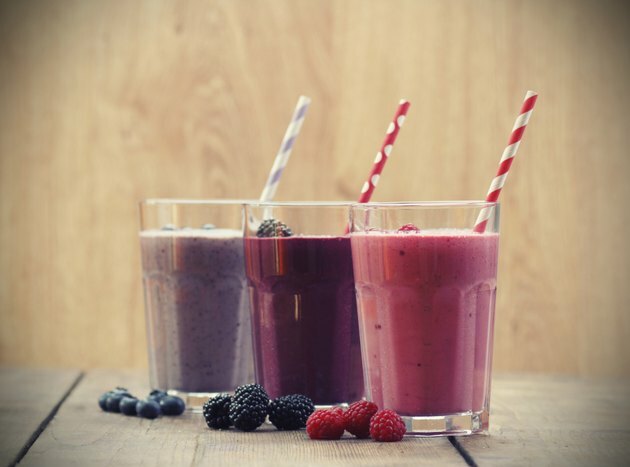 The smoothie, which is fat-free, also adds 1 g of carbohydrates, 150 mg of sodium and 45 g of protein to your daily intakes. The medium-size Gladiator, which is 32 oz., contains 270 calories. It amounts to 13.5 percent of your daily calories if you eat 2,000 calories a day. The smoothie also has 1.5 g of carbs, 225 mg of sodium and 45 g of protein. The largest available Gladiator is 40 oz. It has 360 calories and represents 18 percent of your caloric intake when following a 2,000-calorie diet. It also has 2 g of carbohydrates, 300 mg of sodium and 45 g of protein.